If you would like to get the most from your Nest Vendor, below are some additional features that can be used. 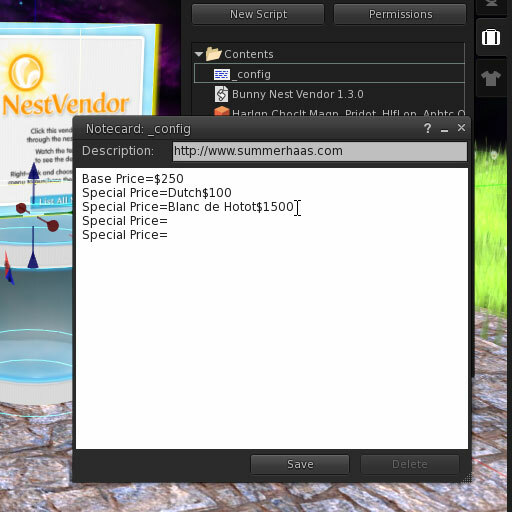 If your nests will have different prices in the vendor then you will need to setup the "_config" notecard in the vendor. The first step is to change the description field to read notecard or simply an n (as in "n"otecard). Open the _config card and edit the Base Price=$10000 line to be the price you wish to use for the majority of the nests in the vendor. Make sure you put in the $ sign as the script checks the number after that symbol to determine price. Any nests you wish to differ from the base price is entered into the "Special Price=" lines. They are formatted like this, "Special Price=word(s) in nest name$price". For example if you put Special Price=Holland$1000 any nest name containing the word holland would be priced at 1000L. Price=Silver Fox$1500 would result in all Silver Fox's priced at 1500L. Anything that does not have a special price designation is priced as the "Base Price". You can add approximately 70 Special Price entries, however more than 25 per vendor is not recommended. You might assume that all lops in the vendor will be priced at 500L and all Hollands at 1000L. Because Hollands are called Holland Lop it would actually price them at 500L as "Lop" was found first. Whenever you use the notecard pricing be very careful and always touch the "List All Nests" button on the bottom of the vendor to make sure you have them all priced correctly. The Nest Vendor is comprised of a single script with an optional "_config" notecard. 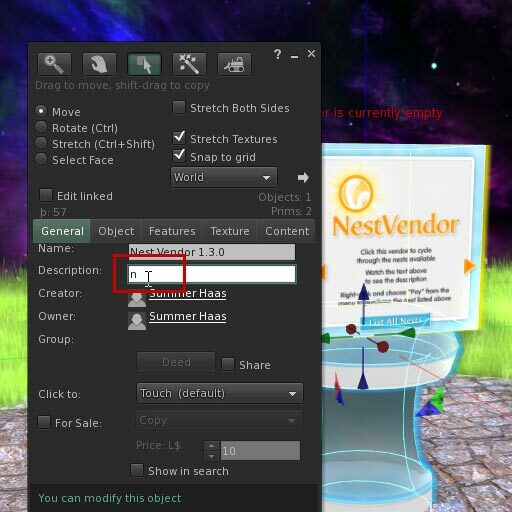 You can put a copy of the vendor script (and _config notecard if using that feature) in any of your objects making it into your own unique vendor. 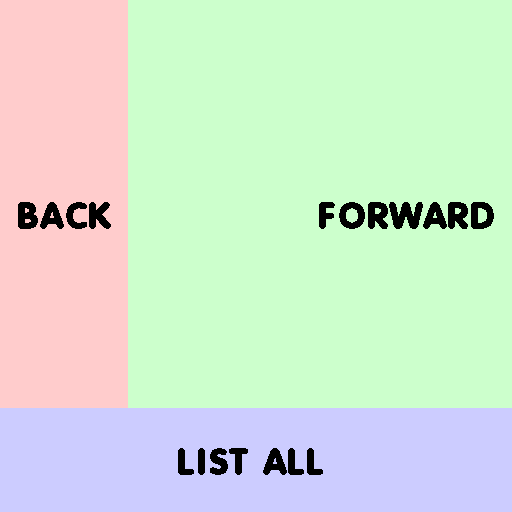 If you are using an irregular shape like a sphere or sculpted prim you will want to make sure the hot zones are where they should be for the "forward", "back" and "list all" buttons. You can download a template here: Nest-Vendor-Hot-Zones.png. If you wish to turn off the vendor, change the price to 0 (zero) and click the "List All Nests" button to reset the price. Simply change the price again to turn it back on.